This is the visualisation of our thoughts concerning to the print of our comic. We dicide we like to have a smaller number of special book in a cool box (250 boxes - a idea we´d been talking about in July!?) and stick to the plan of four books as four chapter in a variable order - The other option would be to just offset-print one book in a much higher edition (which is rather boring). I´ll sreenprint the boxes in berlin (2/0) and each of us gets about 50 boxes to fold (very simple to do) and pack 5 books inside - and that´s it! GREAT! the idea to print postcarts is cool - i like to do that. But i recommend to wait till we paid the printing & shipping of books and boxes. And if we have some money left we print cards. ... We could put them into the box, too - hehe. A bit whate we were talking about with Faezal... Yes Powil, we decided to add a sketchbook, because we thougth it is a part of how we proceed in the project. what comes into my mind with "sketchbook" is a collection of studies/drawing? is that correct? Nice ideas for the boxes guys!! the map idea feels refreshing to do. I guess that was the idea. Nele would send the boxes to each one of us and I would send the books. But of course it's not definite, until we find another solution/or better way to send it around later. 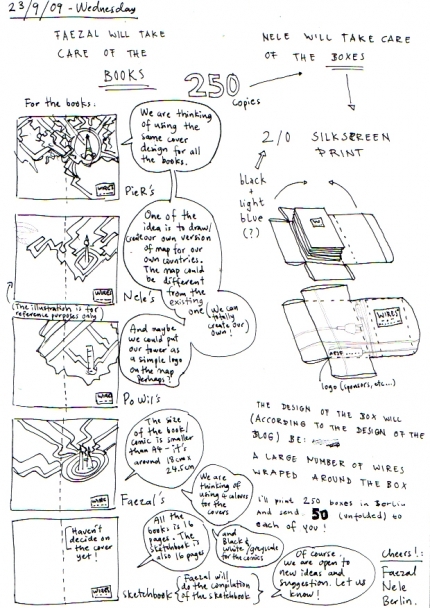 The idea of 'sketchbook' is pretty much showing the process of our project in a certain order and document it properly. So it could be our drawings, sketches, comic pages, character designs (all the creative process behind your comics) etc... So it's like the official behind the scene of WIRES* project. Plus, apart from the blog, I wanted to do some kind of documentation about the project and all the bio/informal interview with the comic artists involved. Later, once we have finish all the artwork, I'll let you all know what I need for the sketchbook. we have to keep in mind that the books will have 16 pages and be very thin - maximum 4 mm. It might look strange in a slipcase. I rather thougth of something like a posting box... not open, but simple to open and it fits in a bookshelf.